Easter in Zagreb is always particularly beautiful so visitors can enjoy a unique holiday atmosphere, special events and traditional food. This year there are several more reasons inviting you to visit the city. The citizens but also all their visitors will enjoy their time marked by Easter, the most important Christian holiday. The city intertwined with parks and flowers, whose spring colours are one of the symbols of Easter, will tell its story with a particular zest in the city district of Kaptol in front of the cathedral. This is where large Easter eggs will be displayed from 9 to 30 April. Decorated according to the Croatian Naïve characteristics, they were a gift by Koprivnica-Križevci county were the art style was created. The eggs are made of plexiglass, they are 2.05 meters tall and 1.5 meters wide and their base is ornate with spring flowers. 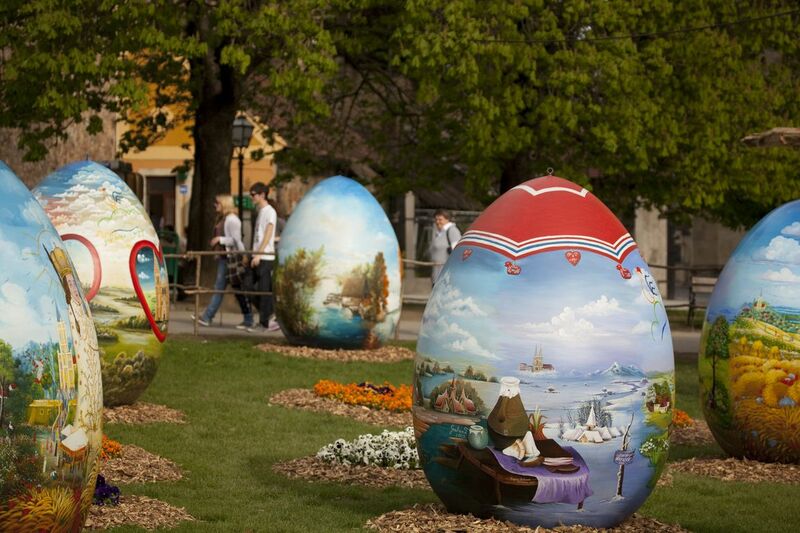 The Easter eggs arouse a lot of interest among tourists and they are one of the most frequently photographed Easter scenes in Zagreb. Easter break will also be more pleasant due to special programs. Zagreb Tourist Board will gift the citizens and their visitors with two truly unique and beautiful concerts – a concert of the female vocal ensemble Ladarice (a part of LADO, the National Folk Dance Ensemble of Croatia which is celebrating its 70th anniversary this year) as well as of the ensemble Projekt Lazarus. On Easter Monday at 12:30 the vocal ensemble Ladarice will perform a special musical program next to the Manduševac Fountain on the main Zagreb square, Ban Josip Jelačić Square. Twelve singers singing in three voices will perform a part of the repertoire a cappella, and a part accompanied by the cymbal and a small instrumental music group. The repertoire of this forty-minute concert consists of songs which cover all Croatian regions and folk zones in styles and voices and it will certainly be a memorable concert for all those attending. The Easter concert of the ensemble Projekt Lazarus, whose main aim is revitalisation of Croatian musical heritage, will also take place on Easter Monday but in the evening (at 19:30) in the Church of St. Mary next to the Dolac market. In the first part of the program this ensemble of excellent musicians will perform selected four voice motets from the book of psalms Clio sacra (1635) of the Italian Franciscan Bonaventura Beretta (Saronno, 1594 — Conegliano, 1687). In the second part Project Lazarus will perform traditional Croatian Easter songs.